Transurethral resection of bladder tumour (TURBT) is the gold standard in diagnosing and treating non-muscle-invasive bladder cancer (NMIBC). The first resectoscope has been introduced more than a century ago, and TURBT remains as a cornerstone in the management of bladder cancer. Although it is a minimally-invasive surgery that has gained favour over the years, the recurrence rate of NMIBC is in general unsatisfactory ranging from 15% to 61% at 1 year and 31% to 78% at 5 years. Tremendous efforts have been made to improve the treatment outcomes of NMIBC, and the current treatment algorithm has been shaped over the past decades. This book chapter shall first discuss about the history of TURBT and the current standard of the initial management of NMIBC, followed by newer concepts that have been proposed including enhanced imaging during TURBT and en bloc resection of bladder tumour. We hope to provide our readers the backbone of the TURBT procedure and new insights that might be helpful in optimizing the management of NMIBC. AUA policy statements. Intravesical administration of therapeutic medication 2015. Available from: http://www.auanet.org/guidelines/intravesical-administration-of-therapeutic-medication. Babjuk M, Comperat E, Gontero P, Mostafid AH, Palou Redorta J, Van Rhijn B, Roupret M, Shariat S, Sylvester PW, Zigeuner R. Non-muscle-invasive bladder cancer: European Association of Urology Guidelines. 2017. 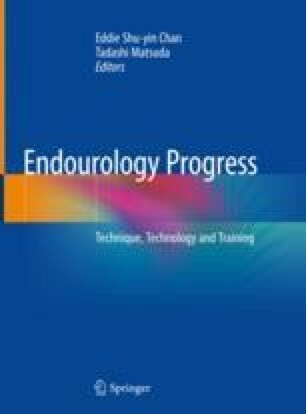 Available from: http://uroweb.org/guideline/non-muscle-invasive-bladder-cancer/. European Museum of Urology. History of urology: European Association of Urology; 2017. Available from: http://history.uroweb.org/history-of-urology/diagnosis/looking-into-the-body/bozzini-and-the-lichtleiter/. Nezhat C. Nezhat’s history of endoscopy. n.d. 2018. http://laparoscopy.blogs.com/endoscopyhistory/chapter_11/. Surgeons TBAoU Virtual Museum Resectoscopes. The British Association of Urological Surgeons. n.d. 2018. https://www.baus.org.uk/museum/133/sternmccarthy_resectoscope. Teoh JY, Chan ES, Yip SY, Tam HM, Chiu PK, Yee CH, Wong HM, Chan CK, Hou SS, Ng CF. Comparison of detrusor muscle sampling rate in monopolar and bipolar transurethral resection of bladder tumor: a randomized trial. Ann Surg Oncol. 2016; https://doi.org/10.1245/s10434-016-5700-7.